Welcome to the third part of a tutorial series that shows you how to make a sprite cutting game similar to the game Fruit Ninja by Halfbrick Studios. In the first part, you covered how to make a Textured Polygon, and made a Watermelon out of it. 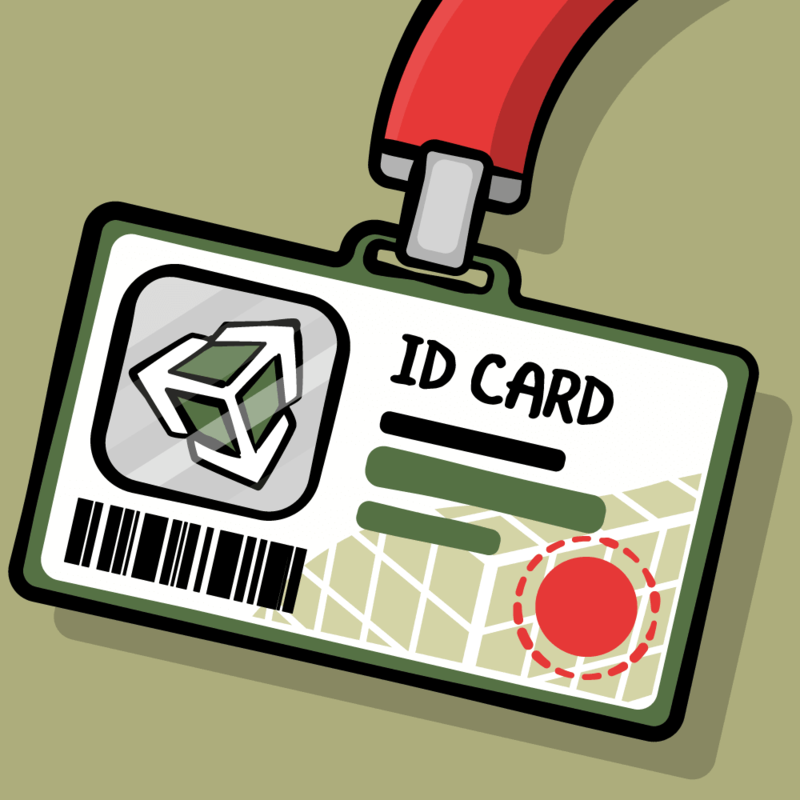 In the second part , you showed you how to use Box2D Ray Casting and some math to split the Textured Polygons. In this final part, you will make this project look like a full-fledged game by adding gameplay, visual effects, and sound effects. 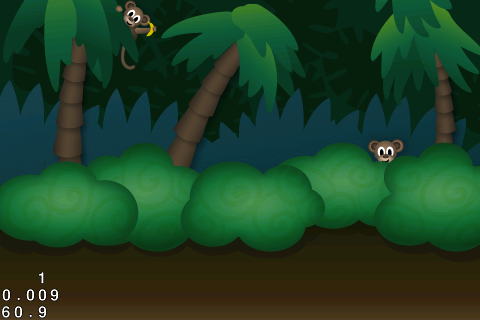 Again, if you are new to Cocos2D or Box2D, please check out the intro to Cocos2D and intro to Box2D on this site first. This project starts where you left off in the last tutorial, so make sure you have a copy of the project from part 2. Also grab a copy of the resources for this tutorial if you haven’t done so yet. You will be adding some cool stuff from the kit to the project later on. So far you have only been drawing one static fruit on the scene. 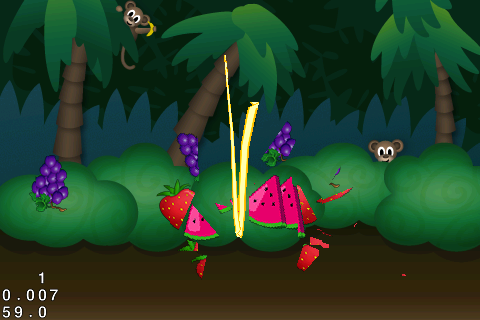 Before you can add the tossing mechanic, you must have different types of fruits. If you haven’t prepared all the fruit classes back in the first tutorial, you can use the copies in the Classes folder from the resources. At this point you should have the following fruit classes in your project: Banana, Grapes, Pineapple, Strawberry, and Watermelon. You added a type definition to PolygonSprite so that the game has a way to distinguish between the subclasses. Next, you create a state for each fruit. An idle state means the fruit can be tossed, while the tossed state means the fruit is still onscreen. You also made the bodies of the PolygonSprites sensors, which means Box2D will not simulate but only “sense” collisions for these bodies. When you first toss sprites from the bottom, you don’t want them to suddenly collide with falling sprites. The player might lose without even seeing these sprites. You added a type value for all the PolygonSprite subclasses, and created 10 of each fruit, and 3 bombs to the game. You don't want them showing up yet, so you cast them offscreen for now. Compile and run, and no fruit should be visible yet. 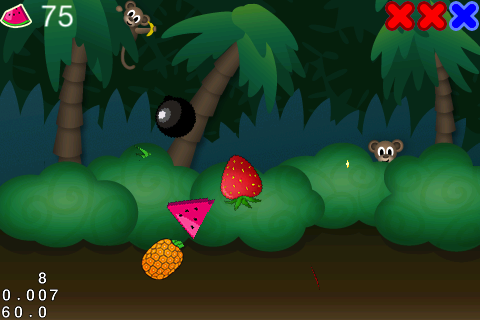 In our game, the fruits are going to be tossed from below the screen. They can be tossed all at the same time (simultaneously), or one by one (consecutively), with some randomness to the interval between tosses, the number of fruits, their position, toss height, and direction. Having this much randomness in the game will make it more interesting. You defined functions that output random floats and integers given a range, and also created a type definition for the two kinds of tosses mentioned above. nextTossTime: This is the time when a fruit, or a group of fruits will be tossed next. It is always compared against CACurrentMediaTime(), which is the current game time. You initialize it with 1 second more than the current time so that the first toss doesn't happen immediately after the game starts. tossInterval: This is the random number of seconds in between tosses. You will be adding this value to nextTossTime after every toss. queuedForToss: This is the random number of fruits that still need to be tossed for the current toss type. currentTossType: The toss type of the current toss interval. It is a random choice between simultaneous and consecutive. This method assigns a random position to a sprite below the screen, and computes for a random velocity. The min and max values limit the velocity based on the sprites' position so that sprites don't get tossed too far left, or too far right. The values here mostly come out of trial and error. If the sprite is at the leftmost position, an x-velocity of -25 to 75 is enough such that the sprite still lands within the screen bounds. If it's at the middle, then it's -50 to 50, and so on. After computing all the randomness, it informs the system that the sprite has been tossed, activates the sprite's collision mask, and sets their initial velocity. I mentioned before that you don't want sprites that are tossed to collide with falling sprites, so you must be wondering why we call activateCollisions here. This method only sets the category and mask bits of the sprites, but it doesn't change the fact that these sprites are still sensors. It's important to change these bits because when the sprites are split, the new shapes aren't sensors anymore, and they will inherit these properties as well. This method already sets the random position and velocity per fruit, so the next logical step is to create the mechanic that tosses fruits at random intervals. Step 1: Checks if it's time to toss fruits again by comparing the current time with the nextTossTime variable. Step 2: If there are still fruits queued to be tossed in consecutive mode, it tosses one random fruit and goes straight to step 6. 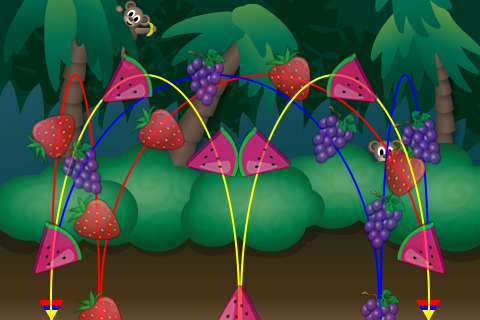 Step 3: Chooses either consecutive or simultaneous tossing modes, and sets the number of fruits to be tossed. Step 4: Tosses random fruits simultaneously. Note that the range of fruit types only goes from 0 to 4 because you don't want to include the Bomb type. Step 5: Similar to step 2. It tosses the first fruit right after consecutive mode is selected and goes straight to step 6. Step 6: Sets the interval between toss times. Whenever a toss type runs out of fruit, you assign a longer interval, else, you assign short intervals because it means you are tossing fruits consecutively. Aside from removing all the physical walls, you also make the gravity weaker because you don't want our sprites to be falling too fast. Compile and run, and you should now be seeing your fruits rising and falling! While playing the game, you will notice 3 issues. Eventually the fruit tossing will stop because you are not resetting the state of the original fruits and the cache runs out of things to toss. The more you slice, the more performance gets permanently worse. This is because you don't clean up the cut pieces when they fall offscreen and Box2D simulates all those pieces. When you cut the fruits, the new pieces stick together: This is because you simply divide the fruits into two without forcibly splitting them. Here you introduce state handling. The sprites start with the idle state, and the toss method changes this state. Since the toss method only chooses idle sprites, yo reset the state of original sprites that get sliced back to idle. In the cleanSprites method, the first part of the code checks for all original sprites that dropped offscreen and resets everything back to their state before being tossed. The second part checks for all sliced pieces that are offscreen, destroys their Box2D body, and removes them from the scene. So that the two pieces don't stick together when the polygon splits, you need to apply some kind of force that changes their direction and velocity. 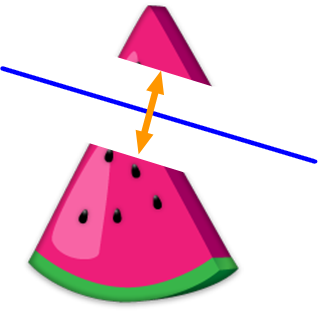 To get the direction, you compute for the world coordinates and angle of the cutting line, and get two normalized vector angles perpendicular to the center of this line. All Box2D angle values are in radians so the number 1.570796 is just the radian form of 90 degrees. Next, you get the coordinates of the center of the cutting line so that you know where the pushing force originates. To push the two pieces away, you apply a linear impulse originating from the center of the cutting line outward in both directions. The impulse is based on each body's mass so that the push effect is more or less equal for both sprites. A bigger sprite needs a bigger impulse, while a smaller sprite needs a smaller impulse. 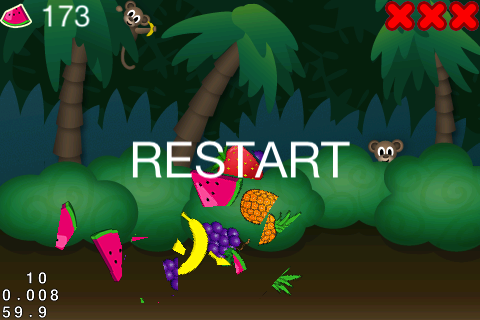 Compile and run, and this time the fruits should split properly, and the game can be played endlessly. The game won't be much of a game without an objective and an end, so you need to put some sort of scoring system in place. You will count score by the number of slices the player makes. You also give the player 3 lives, or chances if you will, which decrease whenever an uncut fruit goes out of the screen bounds. 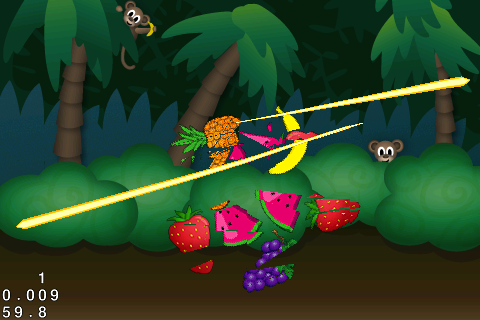 The game ends when the player loses 3 fruits. In the interface, you set up variables to count the cuts and the lives. You also declare a label that shows the player's current score. The initHUD method creates 3 marker images on the upper-right corner of the screen to represent the player's lives. It also puts an image representing the score, and the score value itself on the upper-left corner. The subtractLife method replaces each marker image with a new marker image, representing a life lost, whenever it is called. It also checks if the player still has enough lives, if not, then the game should end. The endGame method simply unschedules the game logic and creates a restart button on the screen. If this button is pressed, then the game is restarted. The restart method just reloads the scene, going back to the very beginning of the game. Now that you've built all these methods and variables, it's time to add them to the game logic. Whenever a polygon is successfully split, the score is incremented, and the label that shows the score is updated. If any original sprites fall to the bottom, then you subtract a life from the player. Compile and run. The game is almost complete! To make things more interesting, you are going to add bombs to the game. You've already initialized 3 Bomb objects earlier, but you haven't used them in any of the game mechanics. Bombs are independent, so they should be tossed anytime regardless of the toss type. If a player accidentally slices a bomb, it will explode and take 1 life from the player. The code is pretty straightforward and similar to what you did before. The first part adds the tossing mechanism for the Bombs in a similar fashion to how the fruits were tossed, but this time without any checks for the toss type, and without counting how many bombs have been tossed. Bombs are also tossed only by a random chance. By calling the modulo 8 operation on a random number, and requiring the result to be 0, there is only a 1/8 chance that a bomb will get tossed at every interval. The second part adds a check to the sprite that was split in the splitPolygonSprite method. If the sprite happens to be a bomb, then the player loses a life by calling the subtractLife method you made earlier. Compile and run. Bombs away! 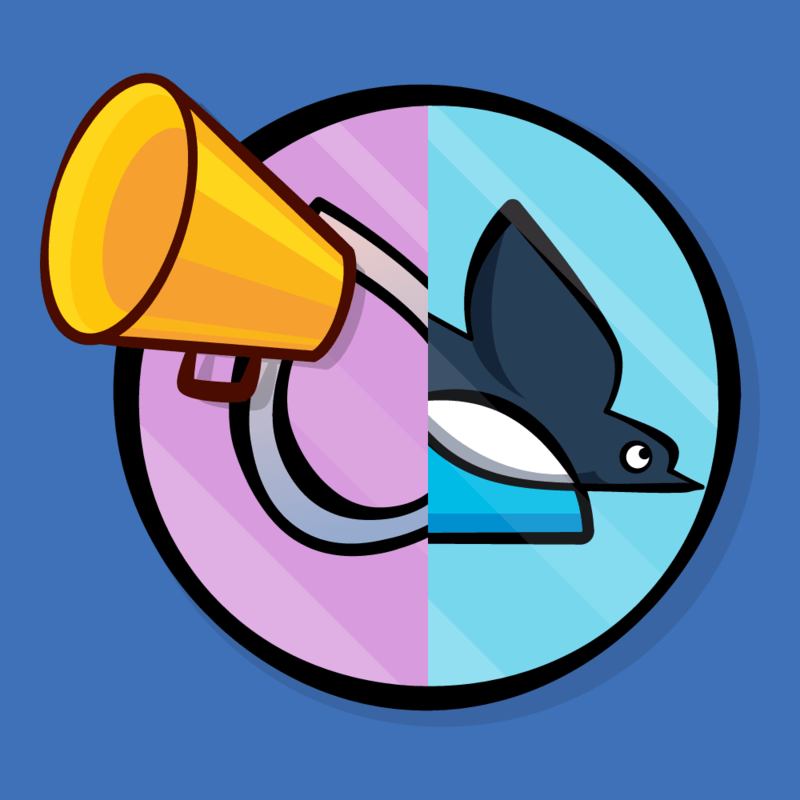 With the game mechanic complete, you can focus on polishing the game. You certainly need to add life to the game. 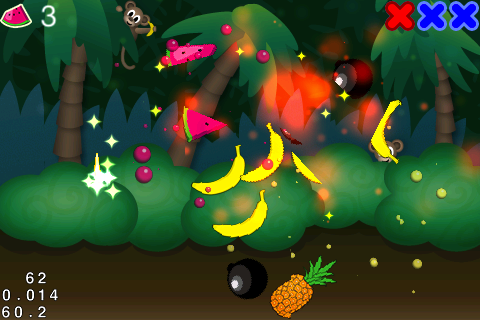 For starters, cutting fruits look dull, bombs don't explode, and the background just seems to be too static. You can improve the scene using particle systems. Particle Systems allow you to efficiently create a large number of small objects using the same sprite. Cocos2D already comes with a customizable particle system, and it works great in conjunction with Particle Designer for visually setting them up. Making particle systems in Particle Designer is easy; so easy in fact that you won't be covering how to do that in this tutorial. Instead, I've already created some particle systems that you can use. Particle Designer exports particle systems in PLIST format. All you need to do is load the PLIST files into Cocos2D. Grab the resources for this tutorial if you haven't already, and in your Project Navigator panel, right-click on Resources and select "Add Files to CutCutCut". Add the Particles folder from the resources to the project. While you're at it, also add the Sounds folder to the project. Make sure that "Copy items into destination group's folder" is checked and "Create groups for any added folders" is selected. You have 5 particles that spray blobs, which you will call "splurt", for when the various fruits are cut. An explosion particle for when the player slices a bomb. A sparkle effect that follows the blade, and a floating pollen effect for the background. You added the floating pollen particles to the background, and made the sparkle effect follow the user's touch. Calling stopSystem simply stops the particle system from emitting sprites, and calling resetSystem makes them emit the sprites again. Both of these particles are endless, meaning that they won't stop emitting unless you call stopSystem. You just added a particle system to the structure of PolygonSprites, and assigned a particle system for each type. You add all the particle systems to our game layer inside the initSprite method, and you make the particle effect appear in the middle of the cutting line when an original fruit or bomb is split. Compile and run, and see particles fly when you slice objects! Our sound effects will not only help set the mood, they will also help the player distinguish the different game events. Aside from the usual sound playing code, you added a time factor to solve for the current velocity of the swipe based on a distance/time formula so that the swoosh sound effect only plays when the player swipes fast enough. You also maintain a reference to 1 swoosh sound effect, and only play it if it is not already playing. You're done! Congratulations, you've just made a complete fruit cutting game for the iPhone! Here is the sample project with the completed project from the tutorial series. Support concave polygons by using triangulation (splitting a concave polygon into several convex polygons). Support polygons with more than 8 vertices by following the same method. Update PolygonSprite to support batch nodes. Support multiple touches and swipes. Cache even the split polygons so that everything can be reused. This is sure to boost performance. Add slice streaks and give bonus points to cutting sprites in sequence. Add special events when certain fruits are cut. More randomness and variety of tosses, like tossing some fruits from the sides. If you have any ideas on how to make the game cooler, or if you have any concerns, questions, and comments on the tutorial, please join the forum discussion below!